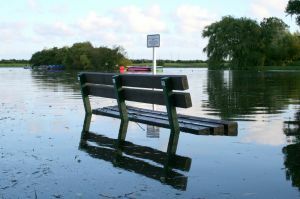 Widespread flooding across the British Isles has affected hundreds of homeowners and business owners alike. But how do you prepare for the unknown? Kate Russell, our own HR Headmistress, explains how. When the rain began falling the other week, I don’t think anybody (not even the weather man) predicted just how much would actually fall. Businesses, homes, communities and livelihoods have been washed away in the space of a week. These past few years have seen some extreme weather and natural disasters. Hurricane Sandy has recently flattened much of the US eastern seaboard, destroying everything in its path. Last year, Japan experienced one of the most extreme events of recent times; an earthquake, tsunami and nuclear power plant meltdown all in one month. That’s a situation that even the best-prepared businesses couldn’t predict. Fortunately, disasters on this scale are not common. It would be easy to take a back seat believing that it’s never going to happen to you. In fact, many people are in denial about preparations even when they know for a fact something’s going to happen. A staggering 60% of adults in the UK haven’t made wills. One of the only certainties in life is death. Taxation is the other! Nowadays, our lives are so interconnected. Organisations work with clients and customers all over the world, so it’s even more true now than ever before that when America sneezes the rest of the world catches a cold. Potentially we are all going to be affected by anything that happens anywhere across the globe. When the Twin Towers were destroyed, businesses everywhere suffered. Some problems were entirely predictable: the airline industry stultified. Nobody wanted to get on a plane again for quite some time. Others were rather less obvious. Recruitment companies said that employers simply stopped recruiting. They went into bunker mentality and absolutely nothing happened for about six months. A business colleague who runs a very successful corporate gifts company said that it was if organisations were holding their corporate breath and waiting to see what happened before getting back into a normal routine. Back in the workplace, organisations need to give detailed thought and plan in advance to prepare for disasters. To lead your business back to work with maximum effectiveness you need to prepare yourself and your employees. Your 'Disaster Recovery Plan' should be put together by representatives of the entire organisation and carried out in several iterations to ensure rigour and completeness. 1. Identify the fullest list you can imagine of serious risk to the business. Assign a probability rating to each risk and assess the likely level of severity. 2. Against each risk decide what your plan of recovery action is and what resources you will need in place to enable the recovery. 3. You will need to identify stages within the process i.e. action in immediate aftermath of the disaster; action in the following weeks; action in the following months. 4. Identify what business functions will need to be resumed and in what order. You will need to identify which employees are key to achieving this. 5. Test the plan. The emergency services hold periodic disaster practice sessions to ensure that in the event of an unusual emergency that things run as well as possible. We saw evidence of considerable success in the London bombings in July 2005. Lessons still have to be refined, but in general the plans worked well. 6. Make sure all critical personnel are well briefed, trained and regularly tested in their specific roles. Keep records of test results. 7. Brief, train and rehearse staff so that they all know what to do in the event of an emergency. 8. Audit and review the plan and update as necessary. Having clear policies and guidelines, training and testing employees in what behaviour is expected of them in these circumstances can go a long way towards making sure your disaster recovery plan works effectively. Hundreds of businesses have been sunk by disasters, both natural and manmade. Your workplace might be destroyed, and your technology pummelled but with preparation and knowledge you can save your employees and your business.